Back in 1988 our Founder, Mark Anthony, received a phone call about a truckload of donated baked goods with no place to go. 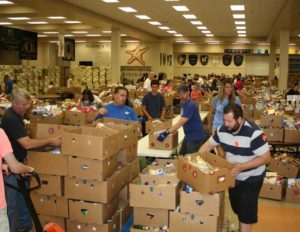 That one call led to the creation of a faith-based organization that provides food to other organizations in the community for their food pantries. What started out as a small venture in a home garage, has grown into a 10,600-square foot warehouse in Ocoee, FL, that served over 175,000 families in 2016 from Central Florida and the surrounding counties. We are a non-profit 501(C)3 organization that relies solely on food and monetary donations from business partners, individuals, and grants; as we receive no federal funding. We do not charge for the food that we provide to the pantries; and we ask only that the word of faith be shared, along with the food that is given to the families in the community. Our Food For Families program provides holiday groceries for Easter, Thanksgiving and Christmas to hundreds of families, with volunteers packing food and delivering them directly to those families in need. In March of 2017, we partnered with the Jamaica Baptist Union, Food for The Poor, and a local Assemblies of Jamaica church, that came together in Kingston Jamaica to feed over 460 families; taking our mission to a global level. We look forward to continuing that relationship and providing resources ongoing. Our Purpose is simple. Provide Food and Hope for those in need. Our Vision is to meet the needs of as many families as we can; and with the community’s help, this is made possible.